E and I are gearing up to go letterboxing (the orienteering game), so I’ve made a couple of stamps. E says that selecting a letterboxing alias and signature stamp is a serious and irreversible ritual, similar in gravitas to the naming of a child. I think that that’s silly, because this is a game where grown adults run around in the woods looking for stamps. 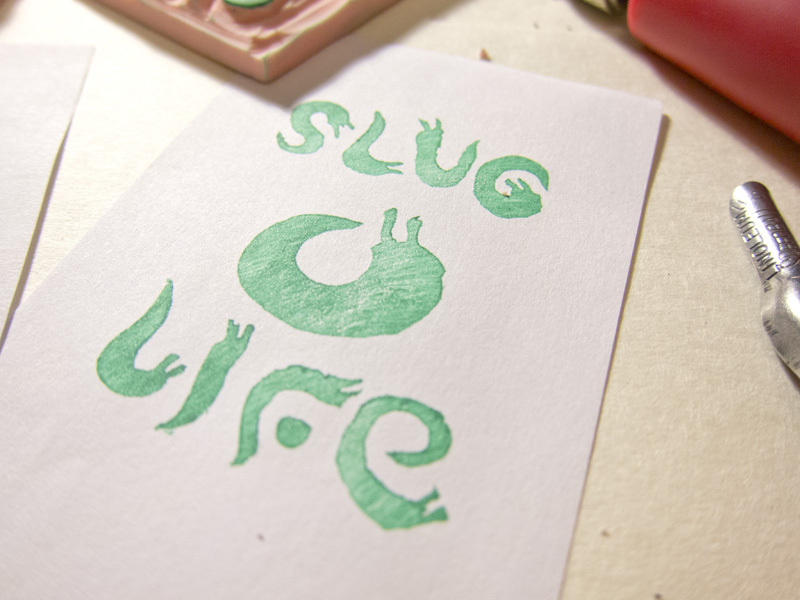 I really like the “SLUG LIFE” stamp, but I think it may have too little gravitas as an alias, even for letterboxing. E suggests that I go by the alias of mr toad (also the name of my pet toad! more on him later). 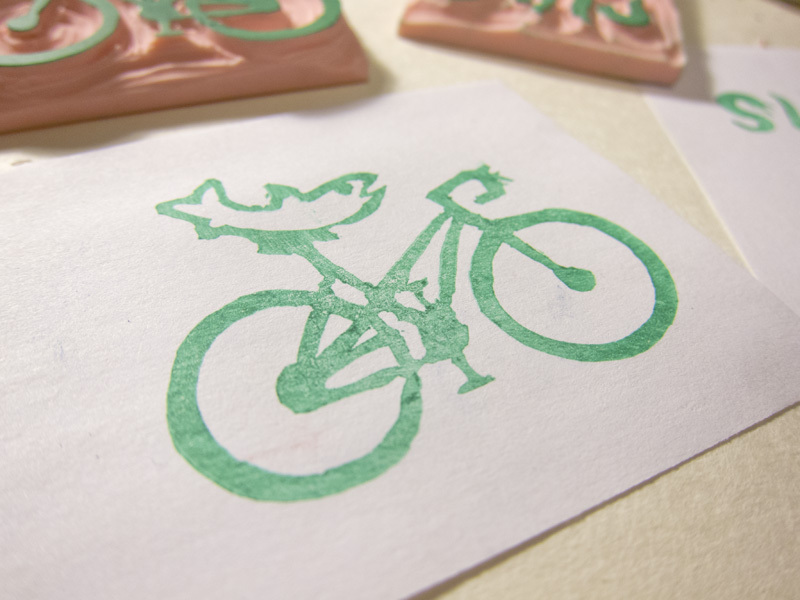 I think I will use the fish on a bike as my signature stamp, regardless of what alias I choose. 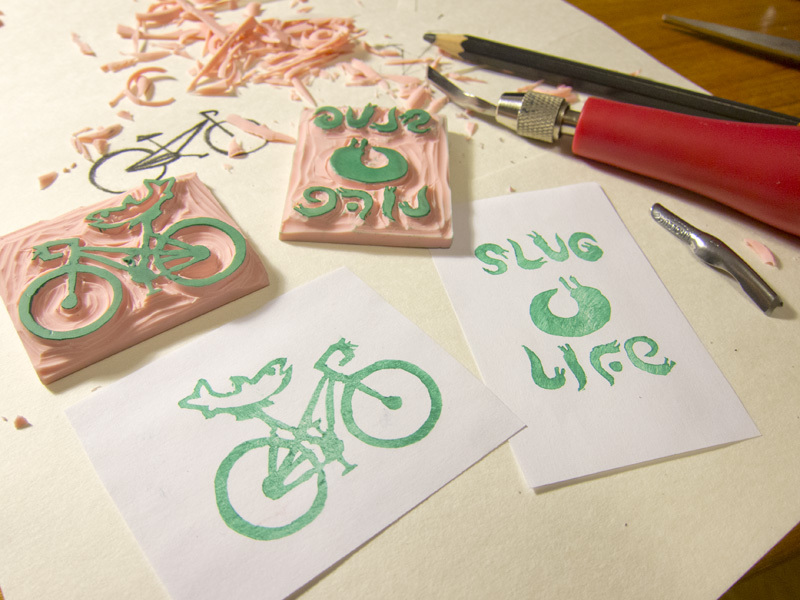 At the Internet’s recommendation, we used a piece of Speedball® Speedy-Carve™ stamp rubber as the base for the stamps. I’m fairly new to cut-block printmaking, but I didn’t have any problems getting the material to do what I wanted. One thing I learned in the process of transferring my pencil sketches to the rubber is that it’s very hard to get graphite off of stamp rubber. I’m glad I taped my drawings in place before rubbing them down onto the blank stamps, because, had they slid around, the transferred images would have been irreparably blurry.